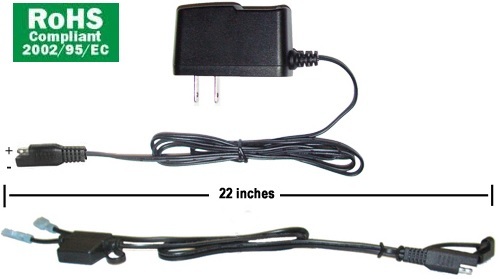 This Charger comes with a 22 Inch F2 Terminal Lugs (.250") Cable Assembly with a 3Amp In-Line Fuse for Battery Charging applications. S-connector to Lug connectors. 3-stage mircoprocessor based applications for charging and maintenance of a wide range of lead acid batteries at the proper working voltage. 6 Volts @ 1 Amp. Use for all types of lead-acid batteries, including flooded, sealed, maintenance free, VRLA, GEL, and AGM. UL Approved. Approx Weight 1 lb. Click here to select an output connector for your application.